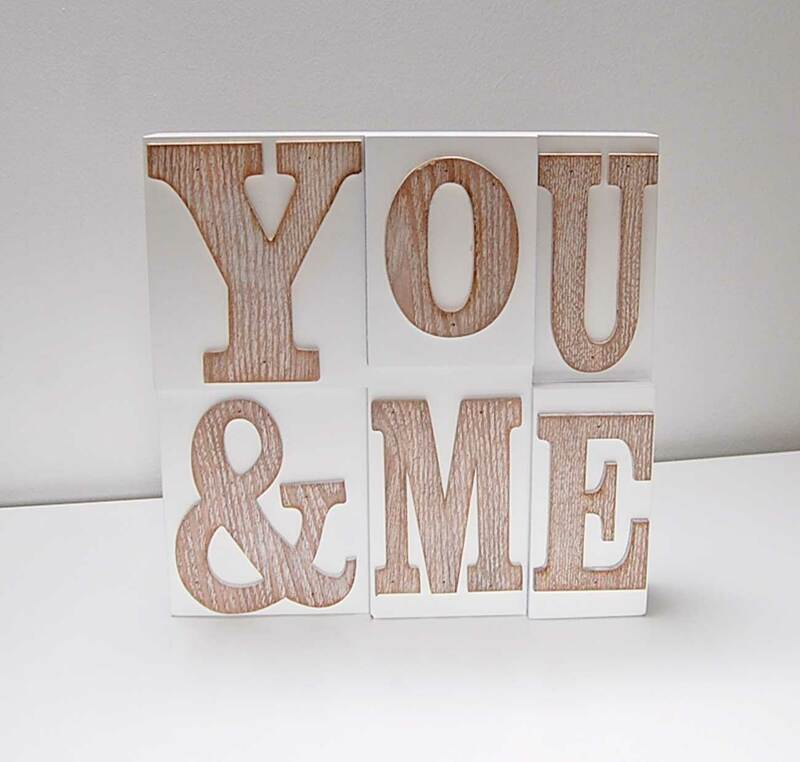 We are delighted to have a selection of all new wedding ceremony and reception signs, wicker hearts, wish tree and tags and decor. 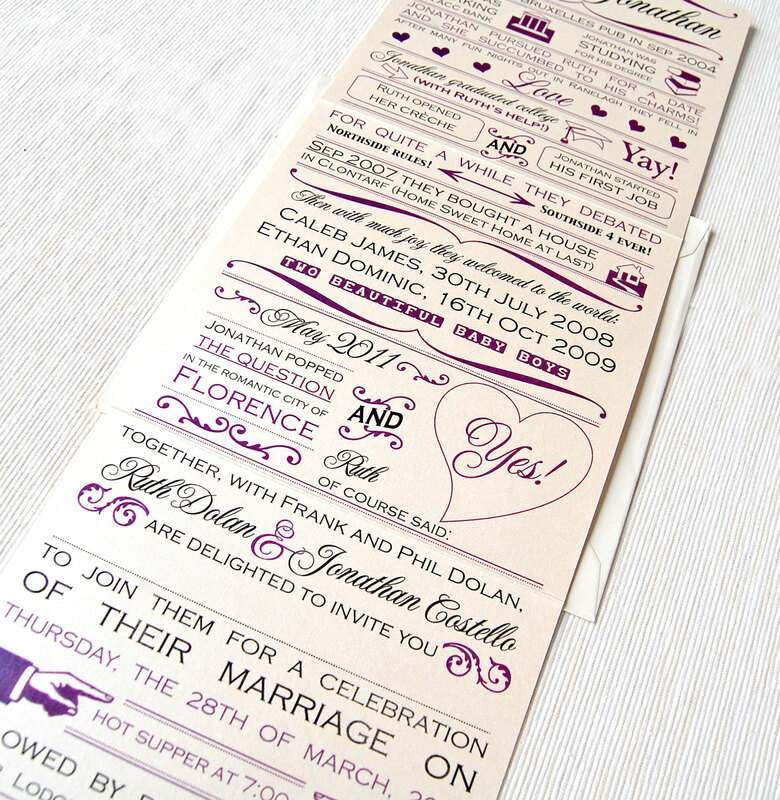 See our website for more. 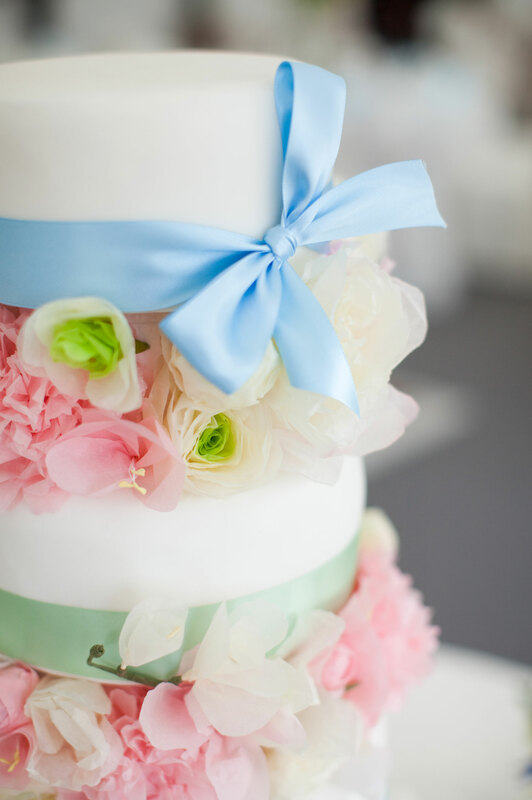 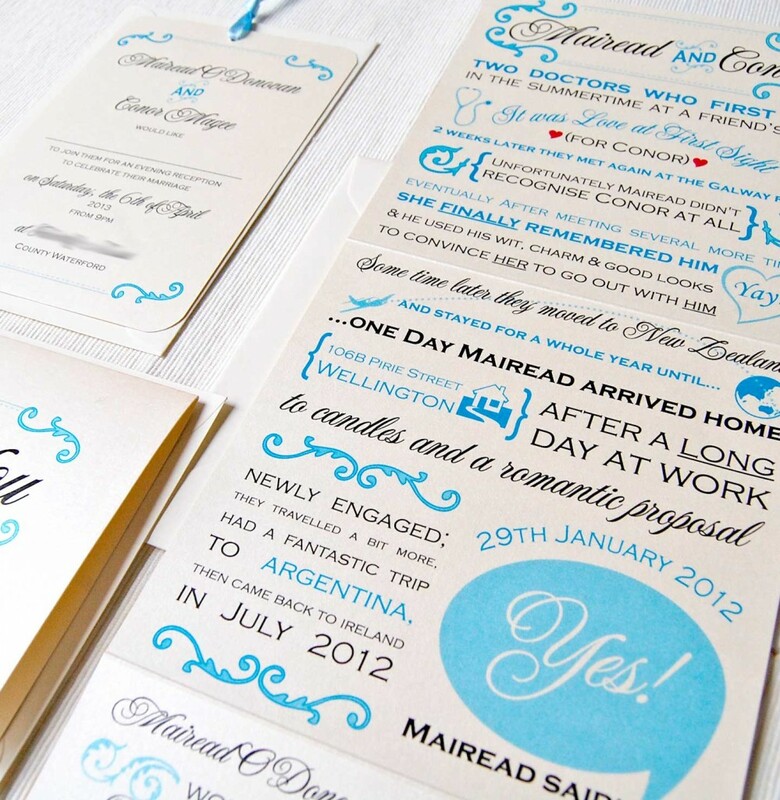 Alice in Wonderland is such a fantastic book to get inspiration from for a quirky wedding. 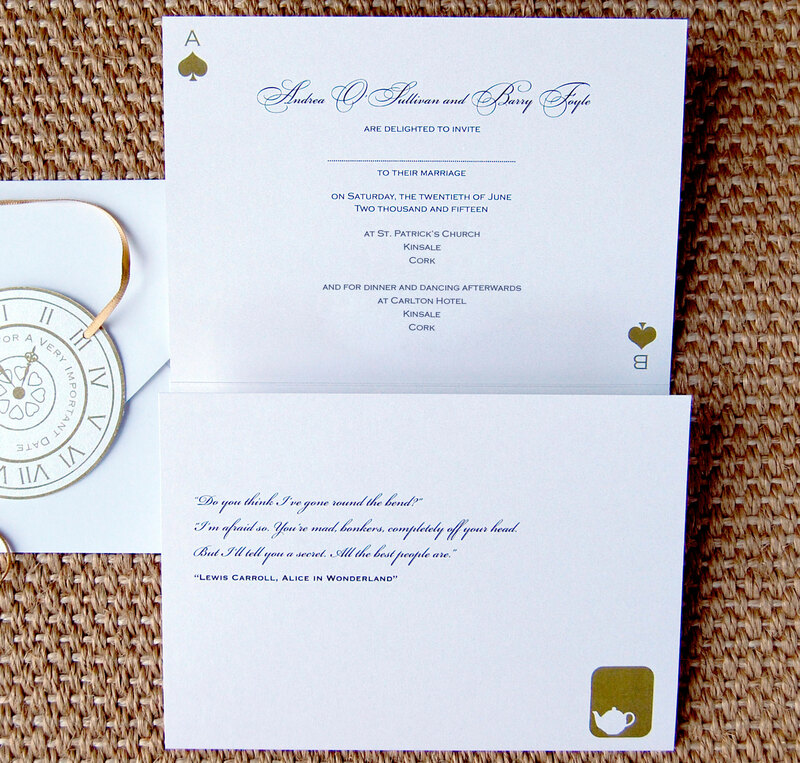 We love Lewis Carroll’s tale so much that we created an invitation based on elements from “Wonderland” with a modern twist. This paneled wedding invitation design includes quotes from the book and icons from the story printed in gold (there’s even a white rabbit). 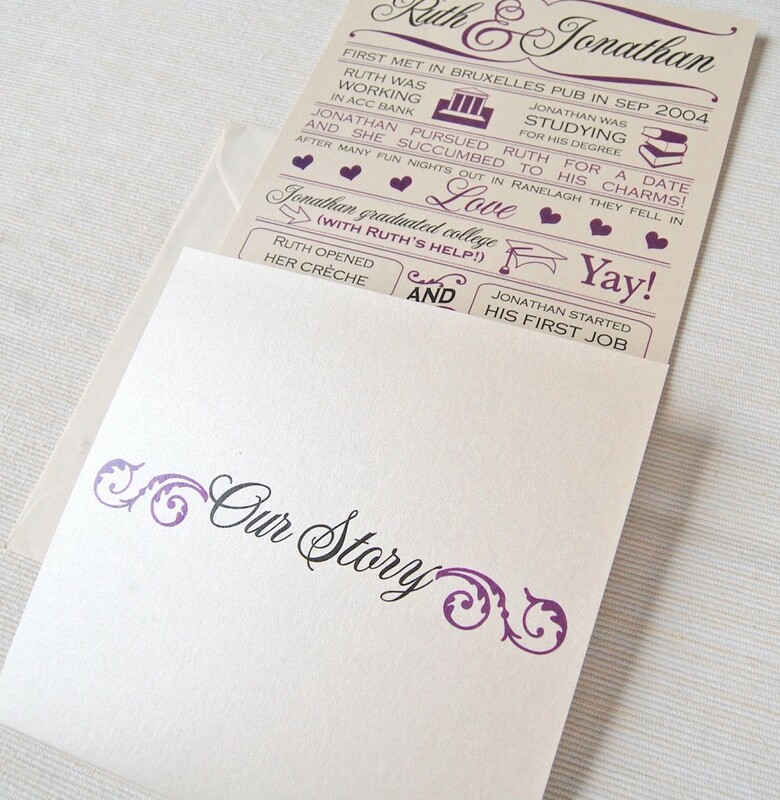 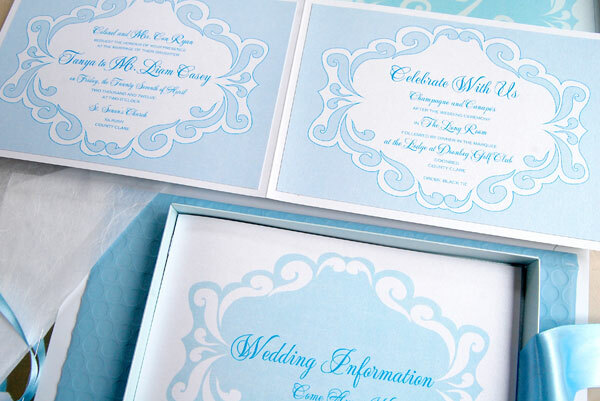 The invitation opens out with three panels for your wedding information and RSVP details. 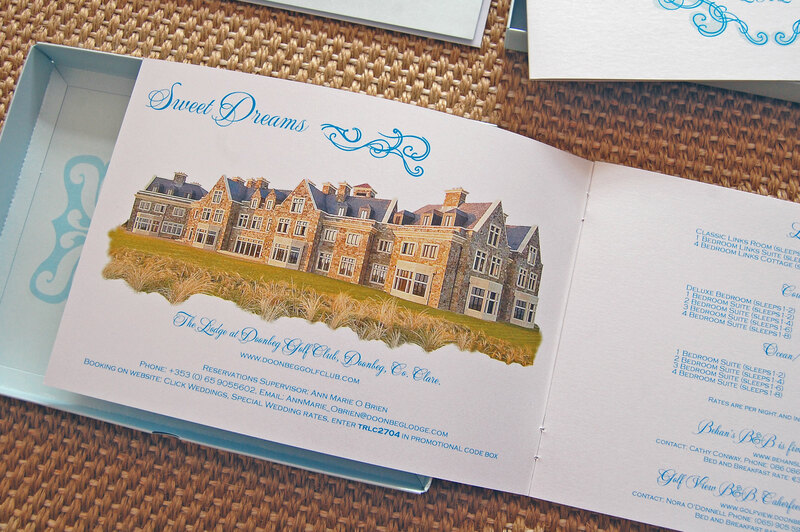 Printed on 290gsm white pearl card and tied with a clock disk bellyband wrap. 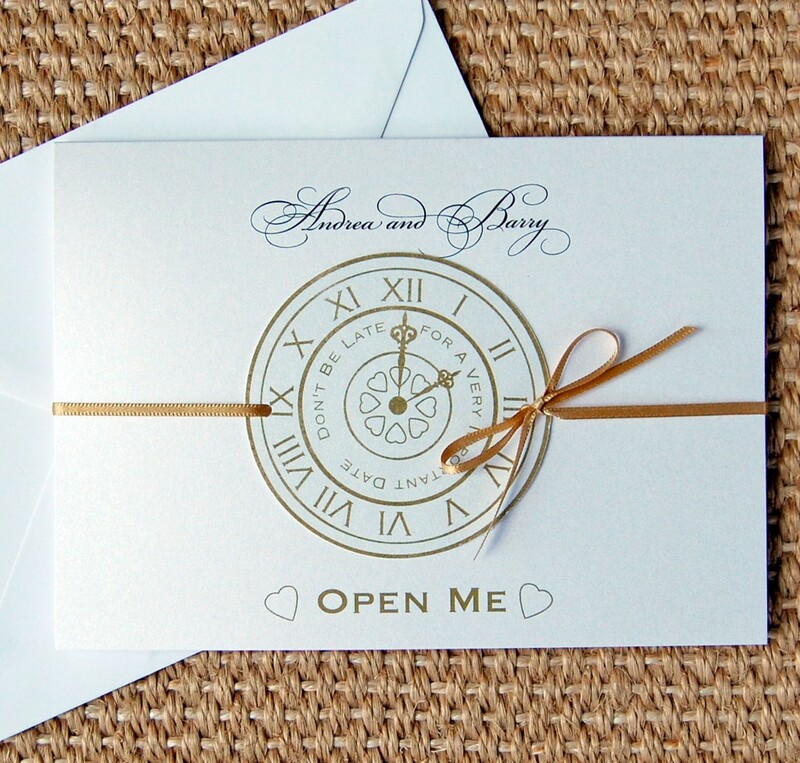 This is sure to make your guests think: “Don’t be late for a very important date”. Big plans for Loli this year. 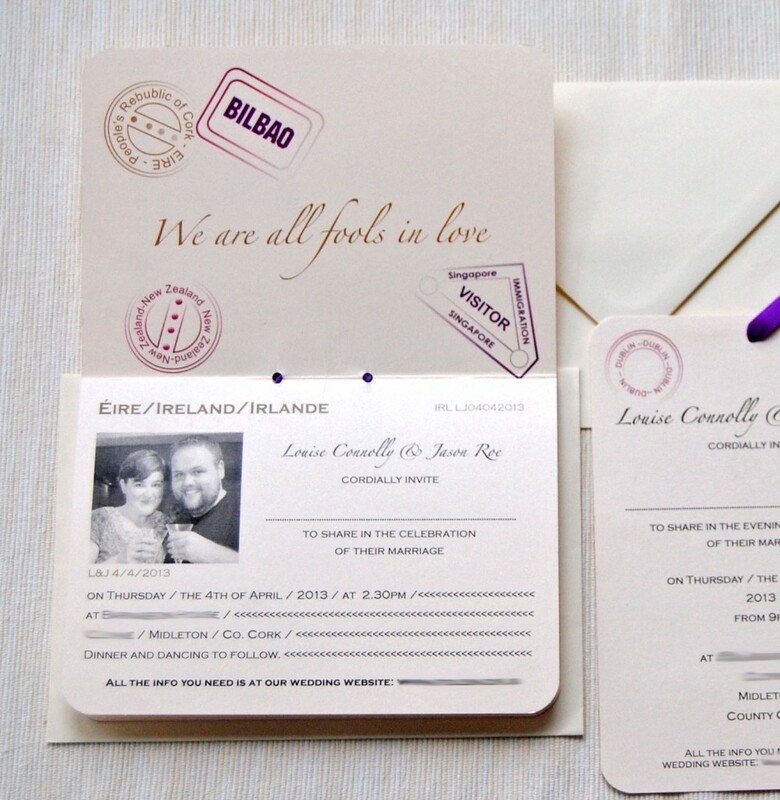 Loli is undertaking a big move to a shiny new studio in the lovely village of Two Mile House, Co. Kildare, this year. 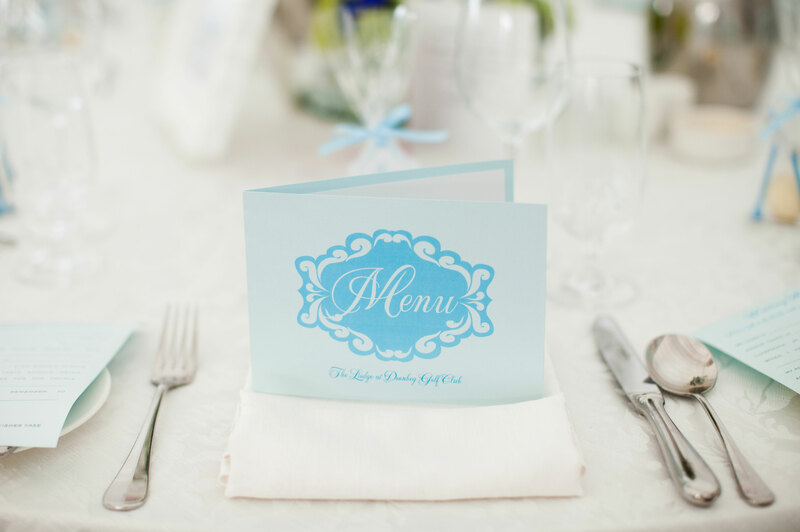 We will be able to take appointments and consult with our lovely customers face to face. 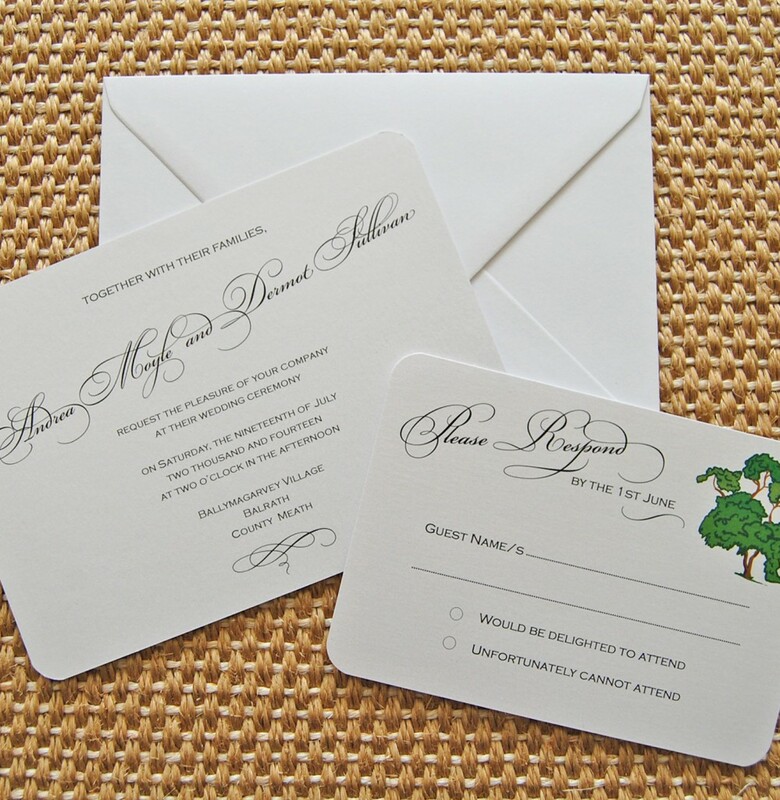 Our website will have a brand new look and we are going to be adding lots of great new designs for 2014. 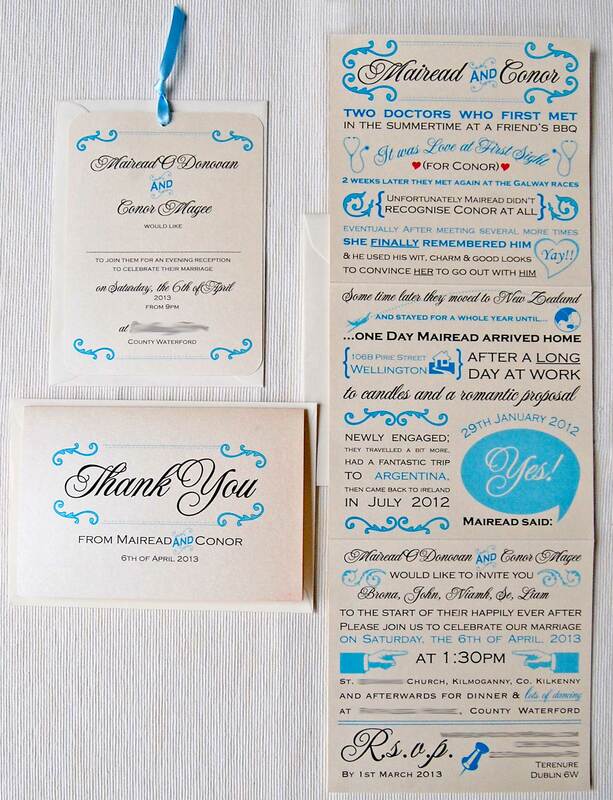 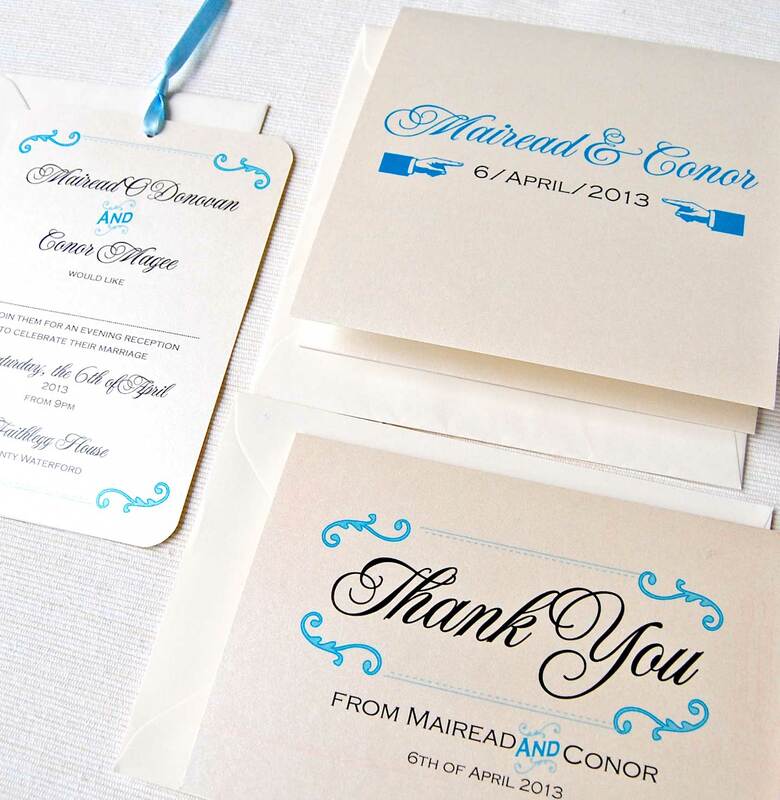 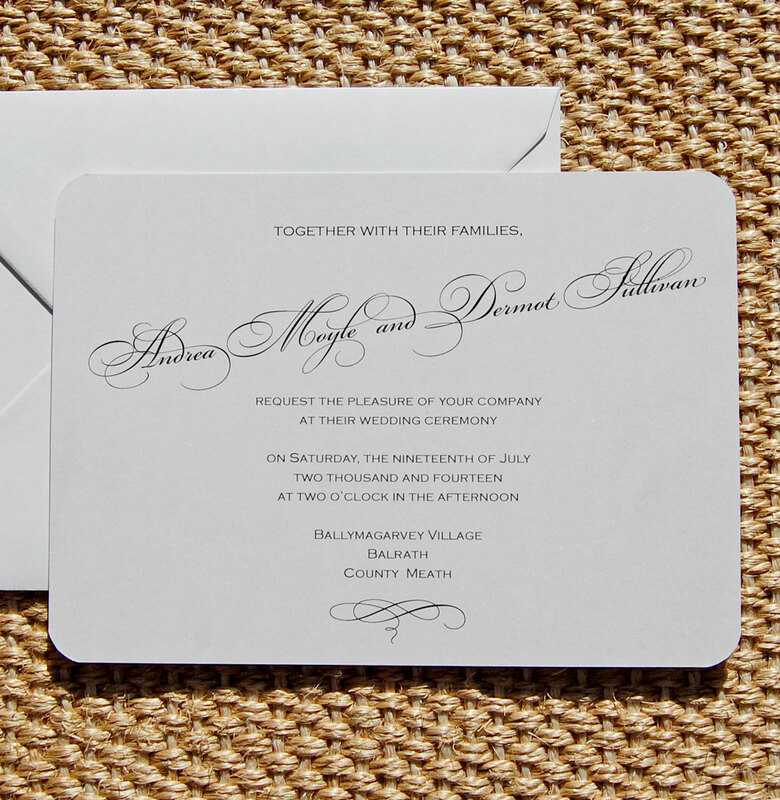 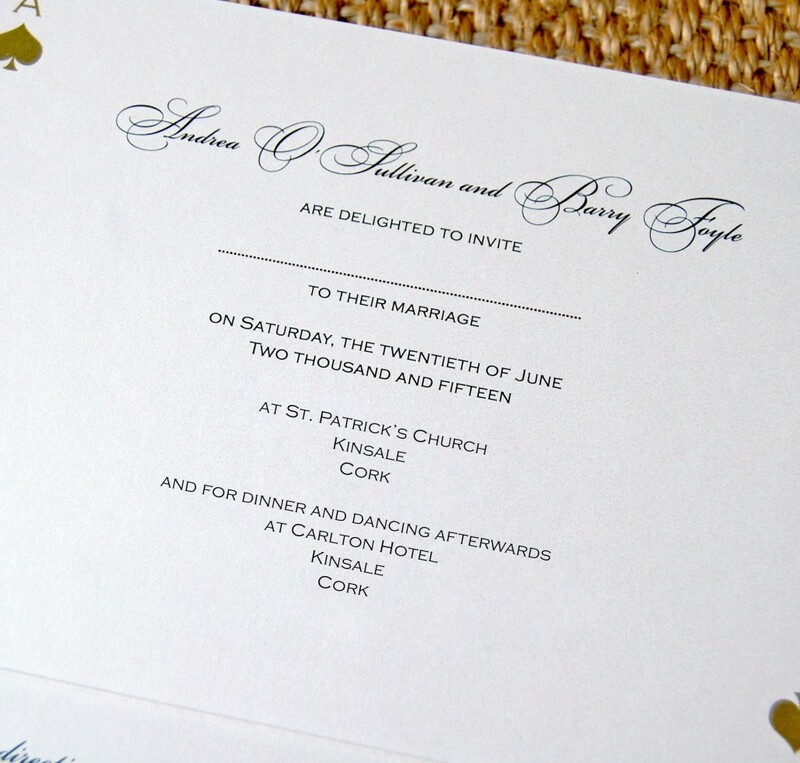 For April appointments please email Colette at: colette@lotsofloveinvitations.ie. 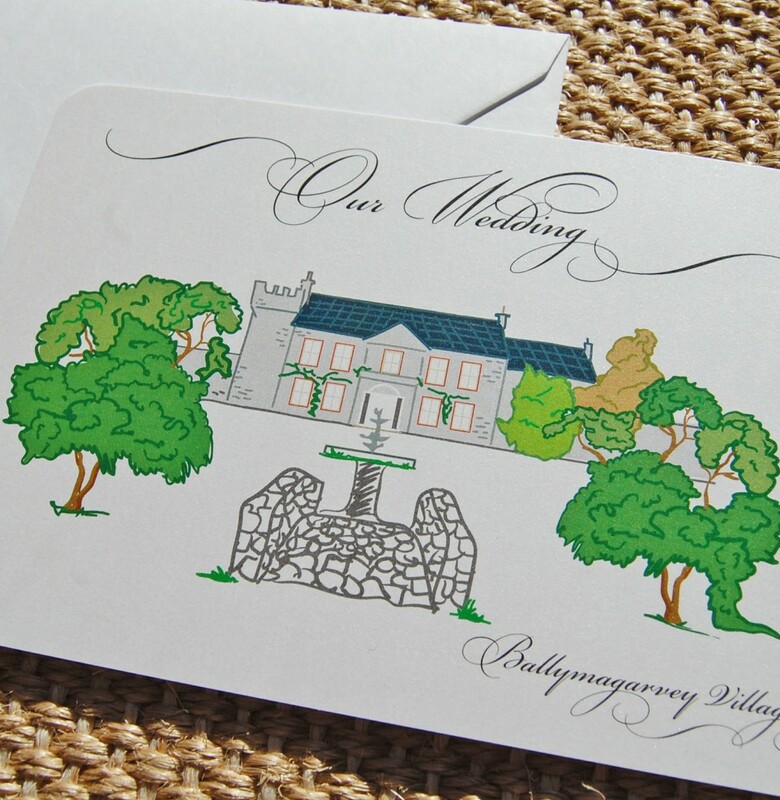 Your Wedding Venue Invitation: You tell us your wedding venue and we create a unique digital drawing for your wedding invitation. 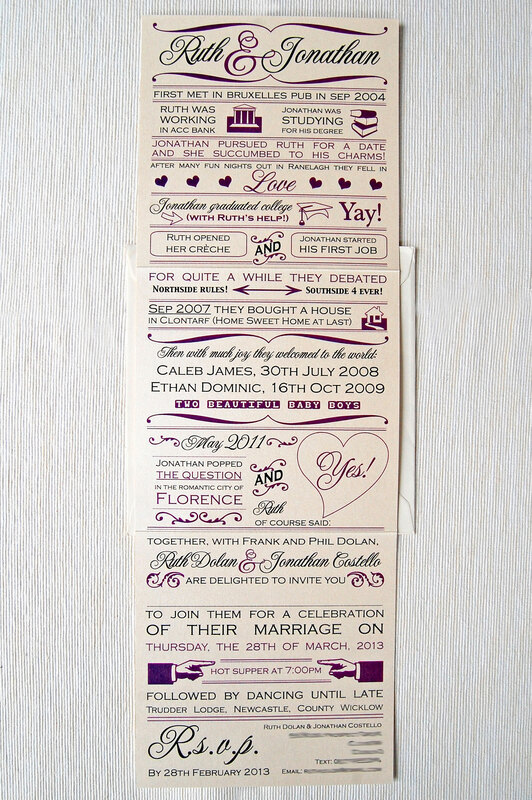 The wedding invitation of Lots of Love Invitations very own designer Tanya. 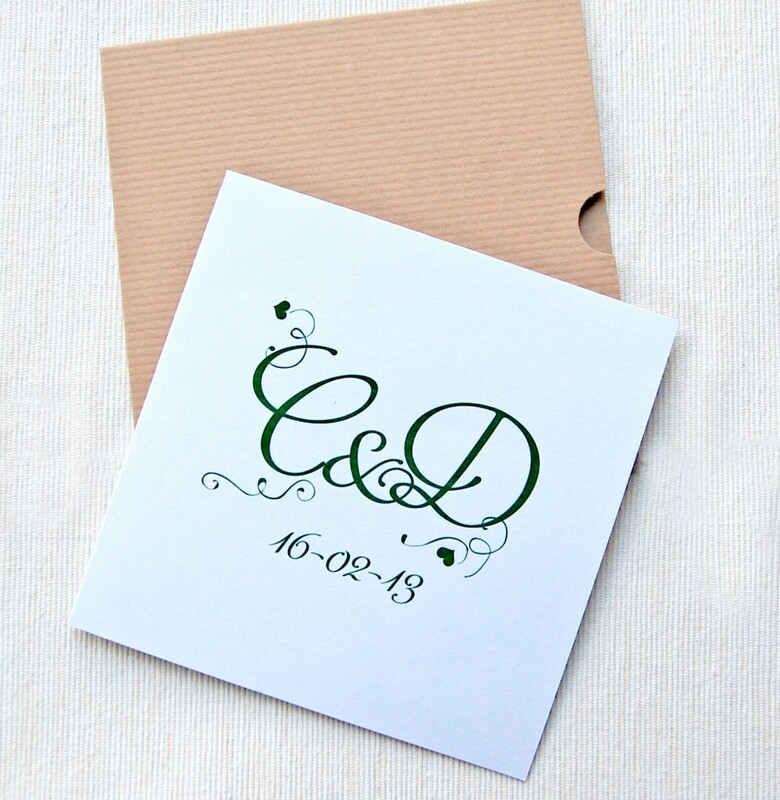 To follow on from our Golf Save The Date Invitation I continued the refelction of our venue by the sea and our personal wedding logo. 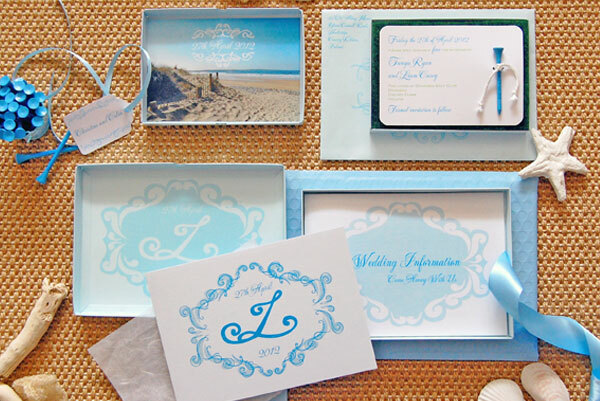 We used pale blue boxed invitations with two pearl white booklet inserts and a pale blue pearl folded response card. 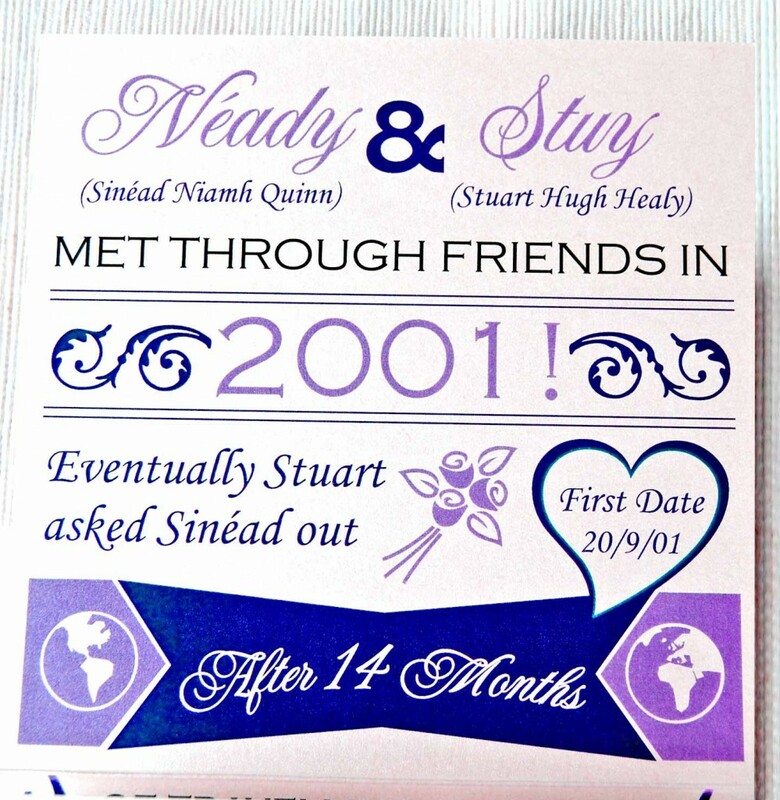 Our wedding details were in one booklet and the additional information for our guests was in contained in the second insert. 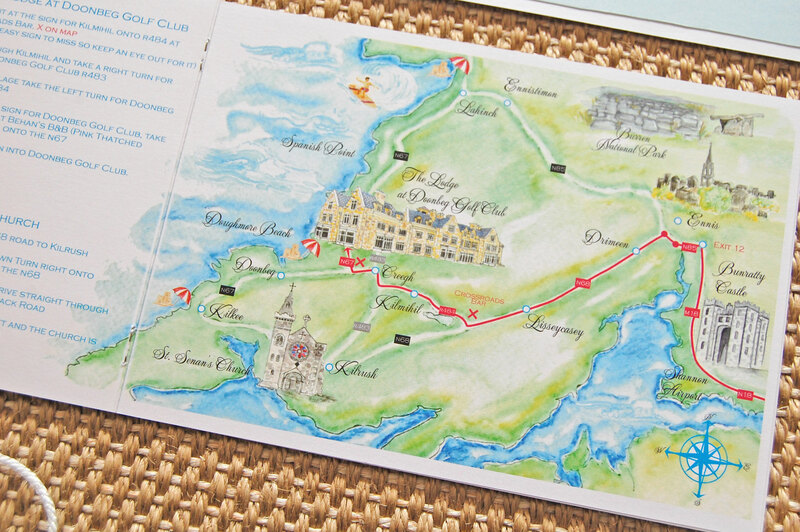 I also had the opportunity to add some custom illustration with our watercolour map of the area. 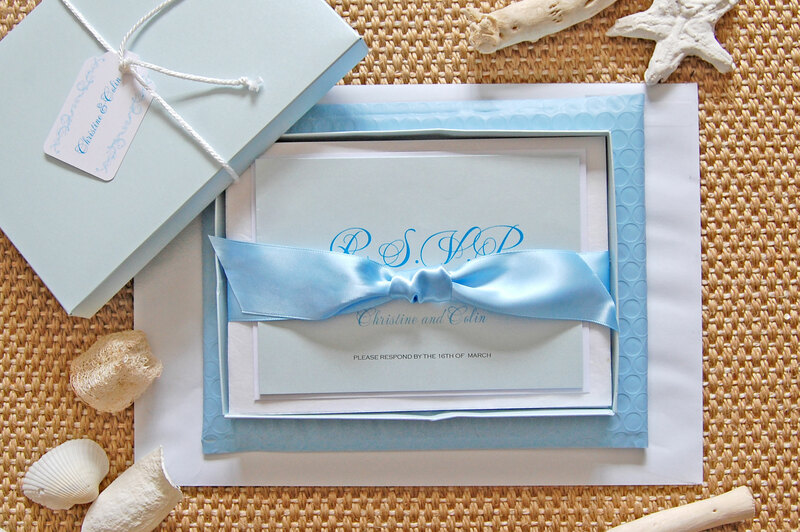 It was a fun set to design and we got a wonderful reaction from our guests. 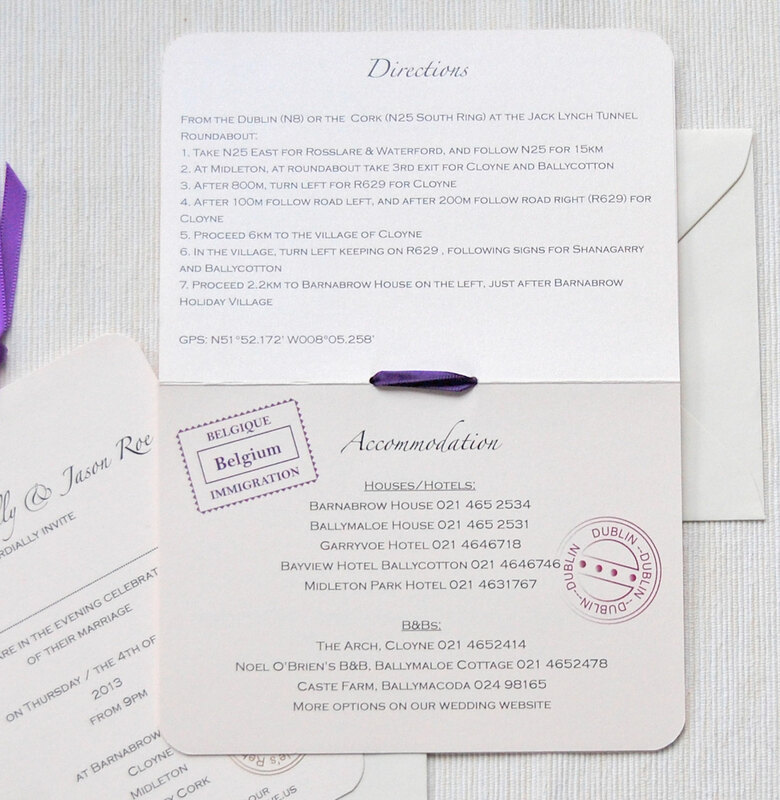 Some extra stationery items that I created, photographed beautifully by Christina Brosnan of Brosnan Photographic on our wedding day. 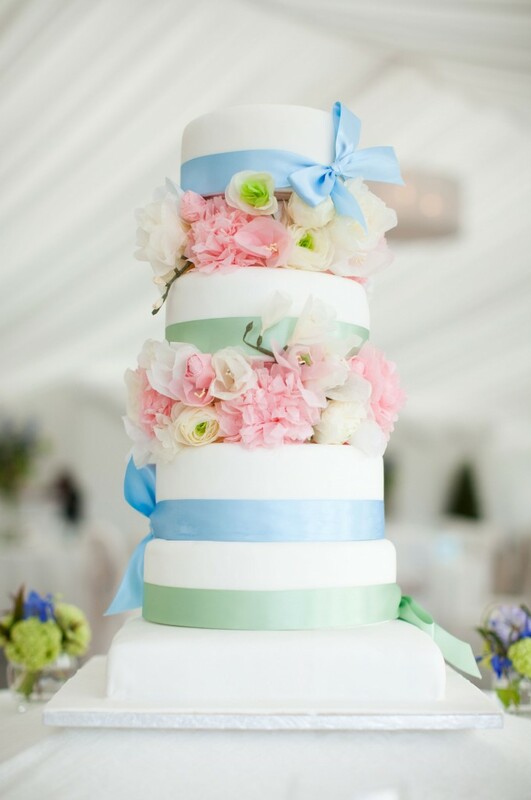 Hand made paper flowers; Freesia, peonies and tulips made from tissue paper. 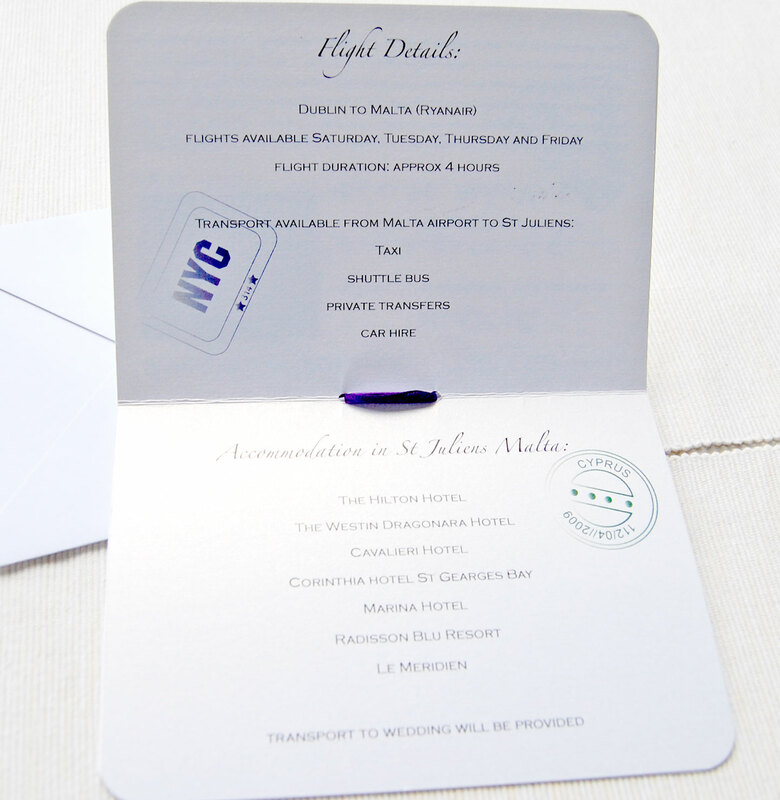 Folded Menu cards with white inserts. 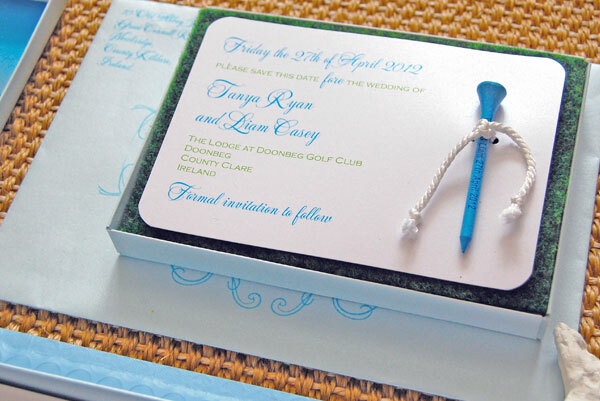 White chocolate handmade golf ball favours, with custom made guest name tags and custom golf tees. 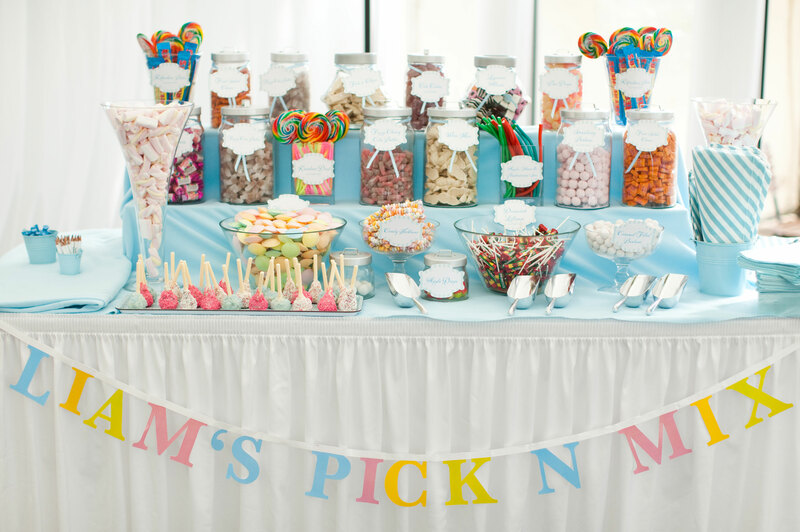 Candy Buffet with custom made labels and sign. 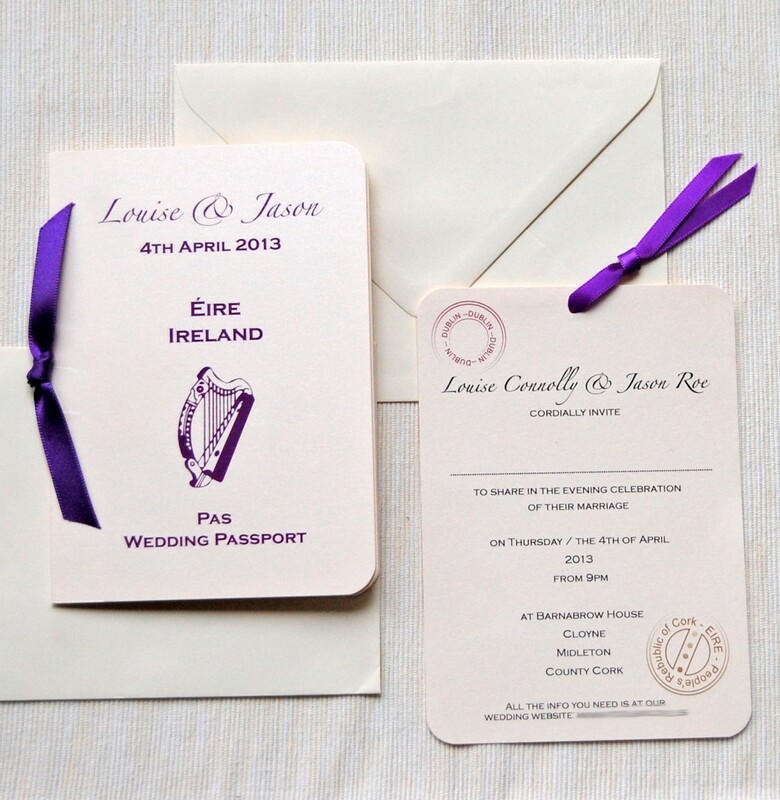 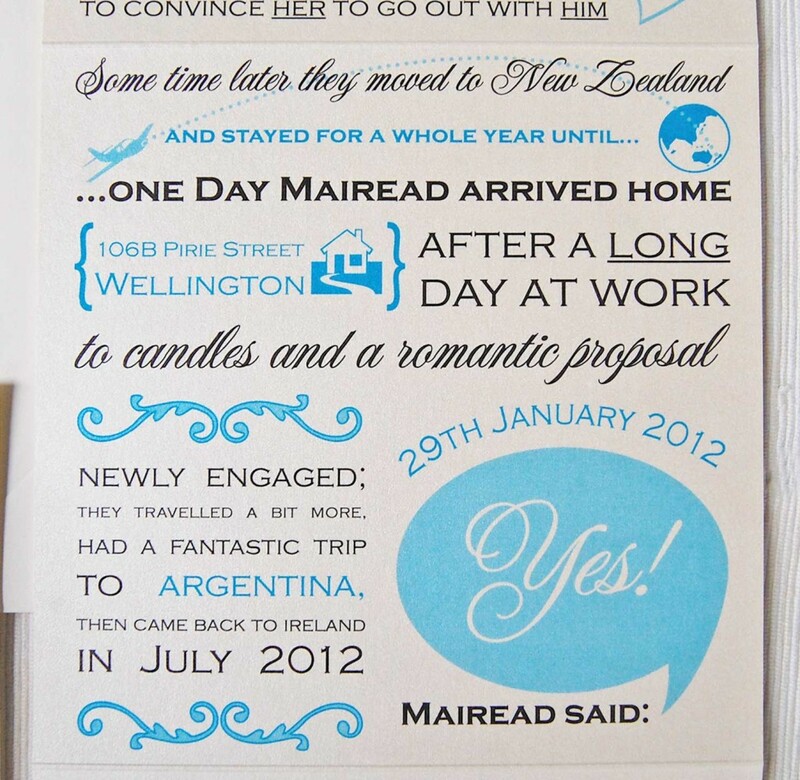 Louise and Jason chose our Passport wedding invitation design for their Spring wedding. 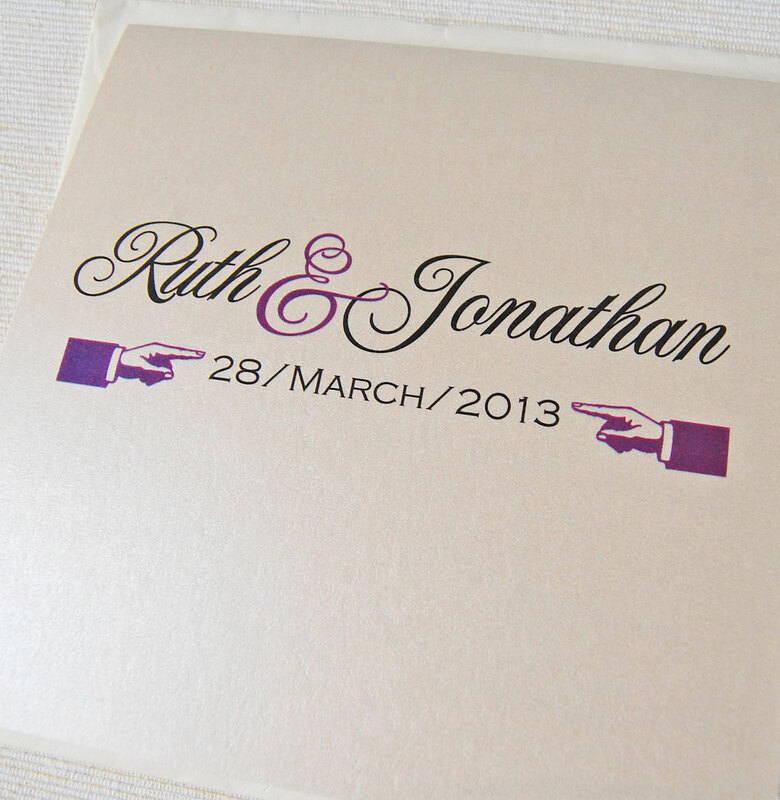 We customised the ivory card with purple and mocha designs and purple satin ribbon tags. 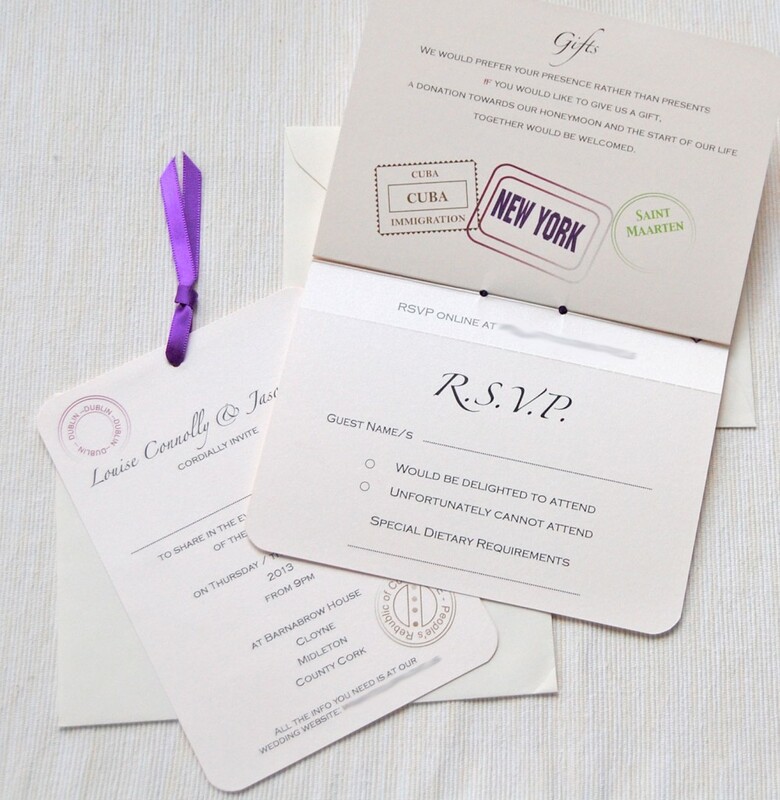 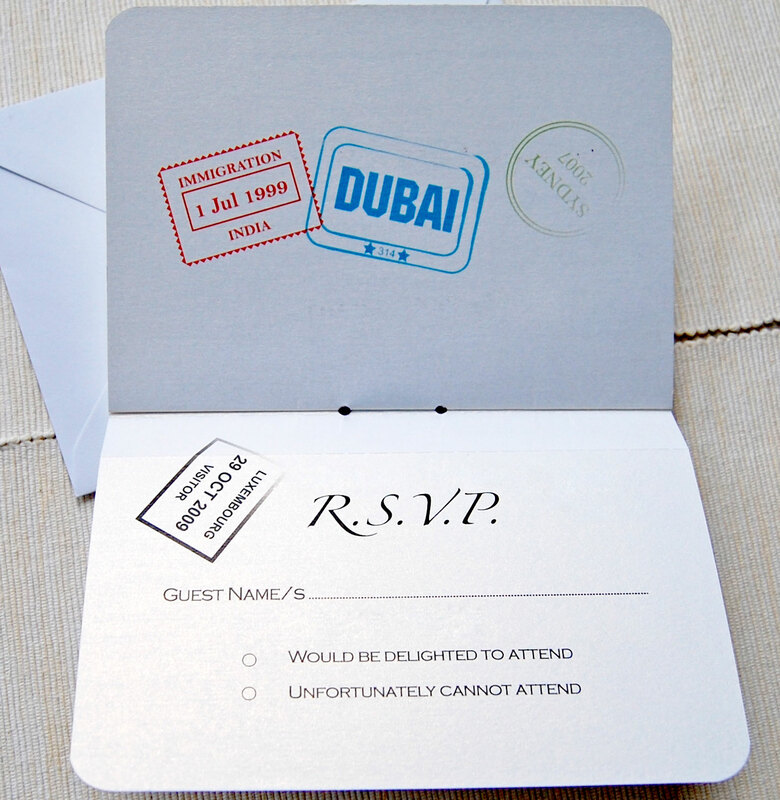 We complimented their Passport invitation with Luggage tag evening invitations. 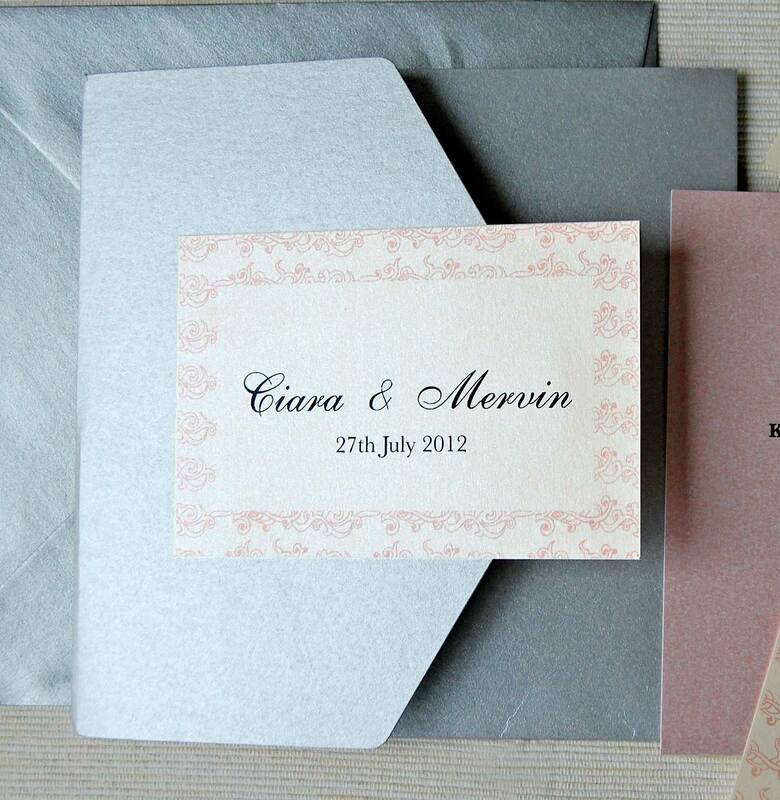 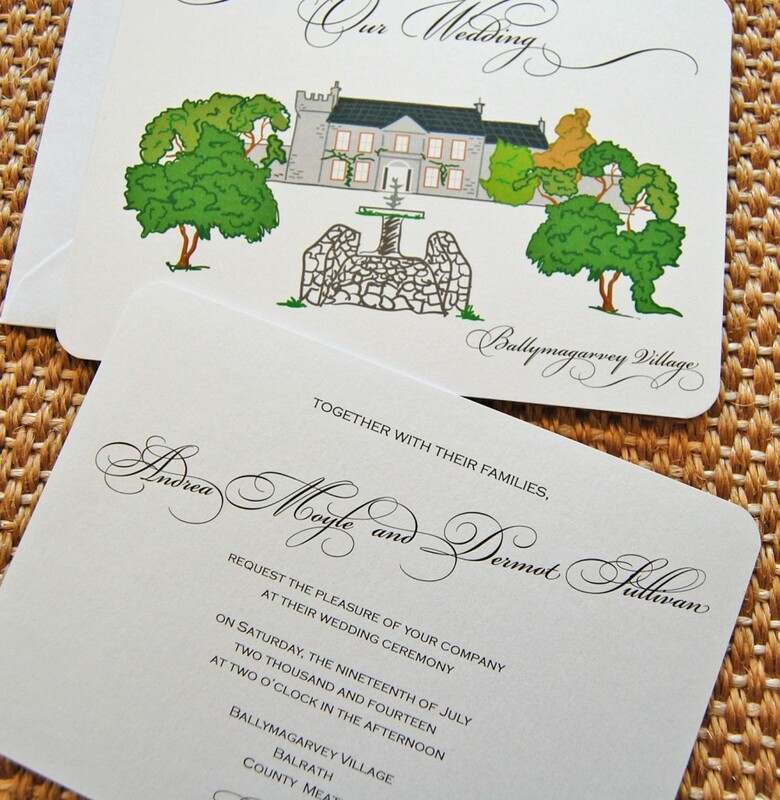 Ciara and Mervin loved the idea of a pocket-fold invitation for their Summer wedding. 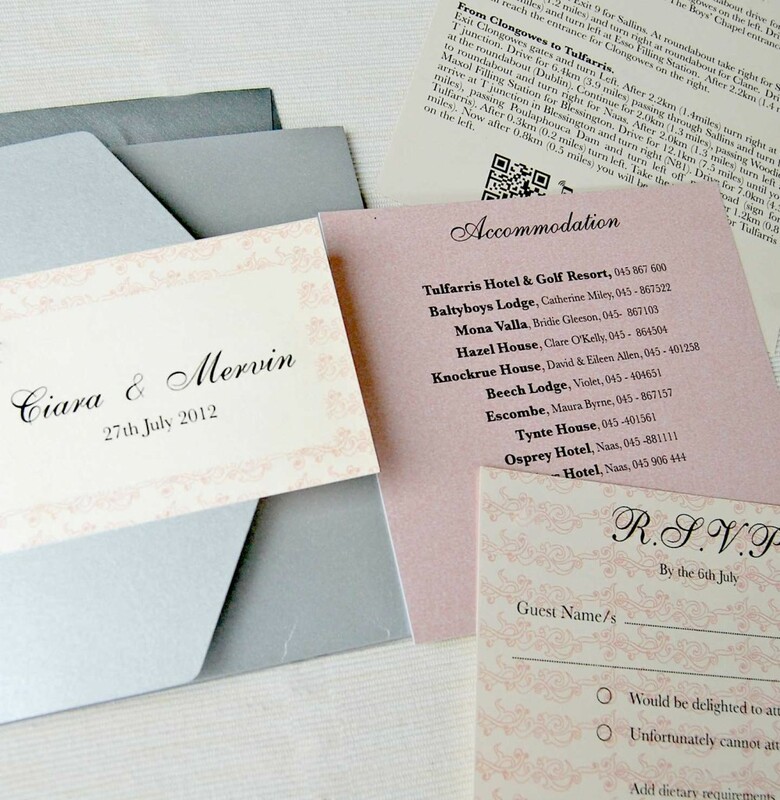 We worked with them to come up with a layered design with patterned paper and coordinating inserts. 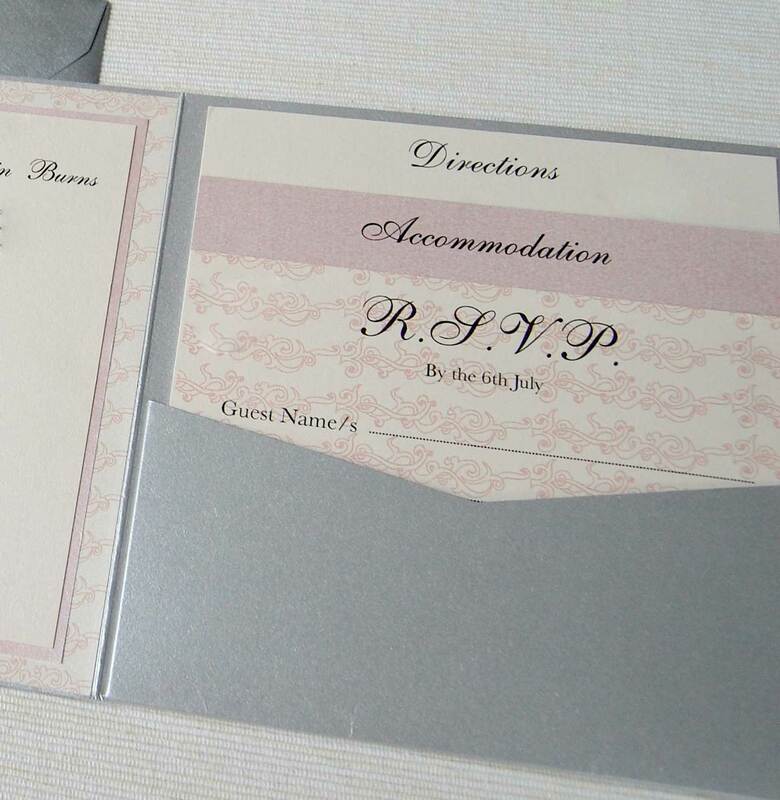 The design included three inserts and metallic envelopes. 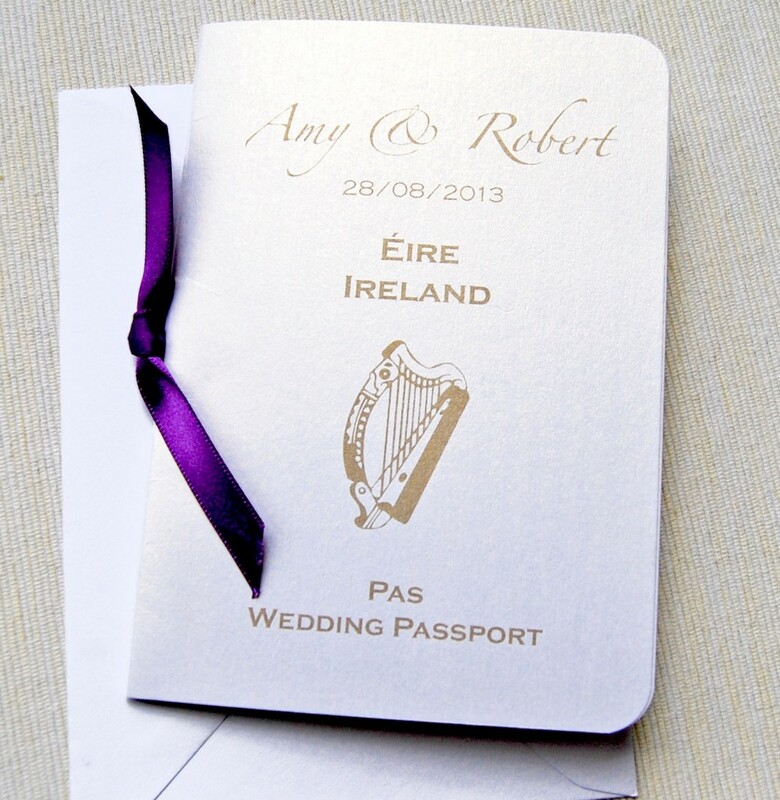 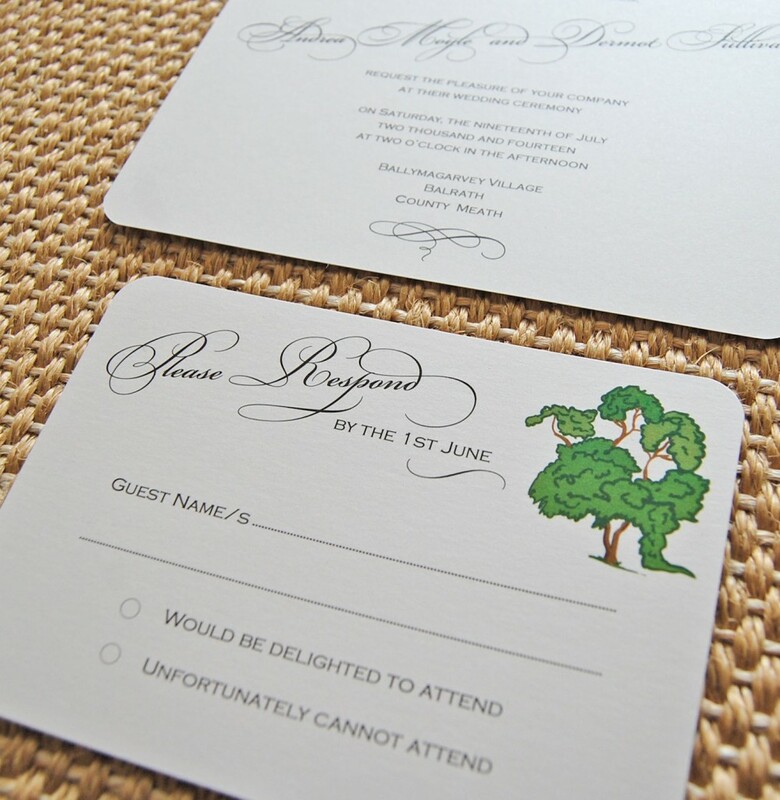 One of our most popular designs at the moment is the Passport invitation. 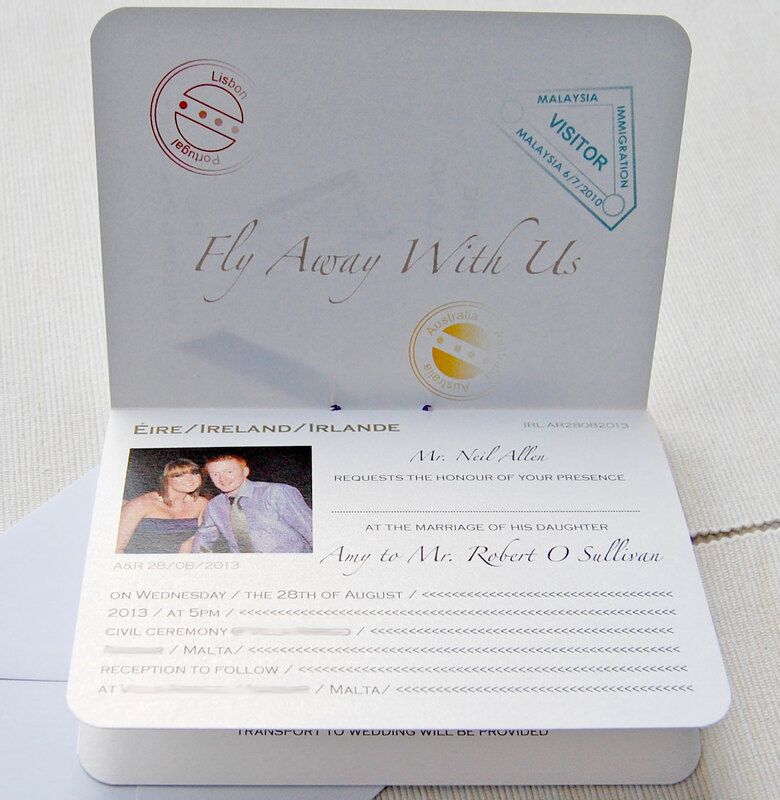 With so many brides and grooms opting to travel outside of Ireland for their wedding it is a novel way to set the tone for a destination wedding. 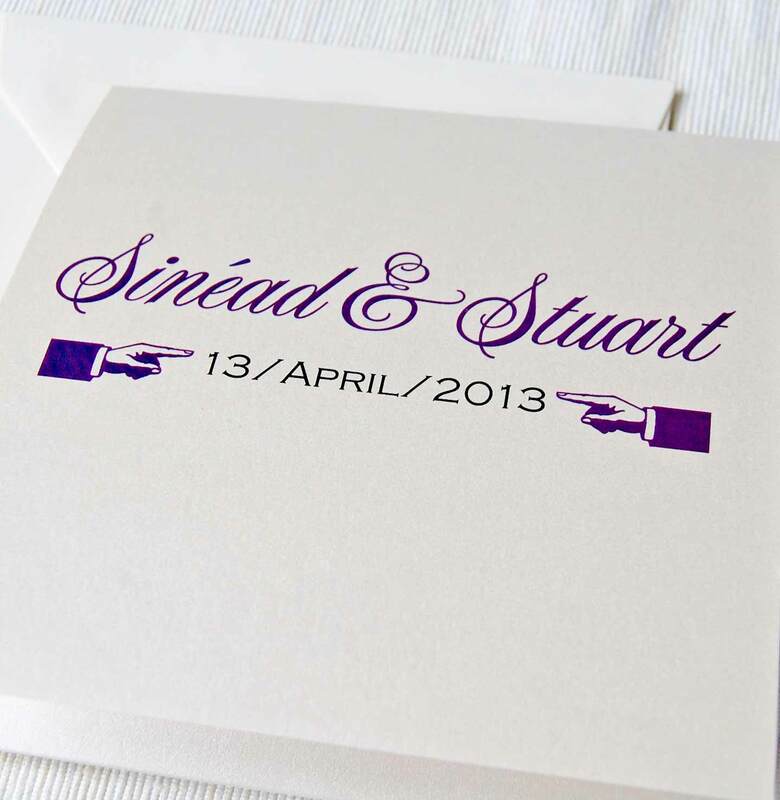 Amy and Robert chose to customise the invitation with white pearl card and purple satin ribbon ties. 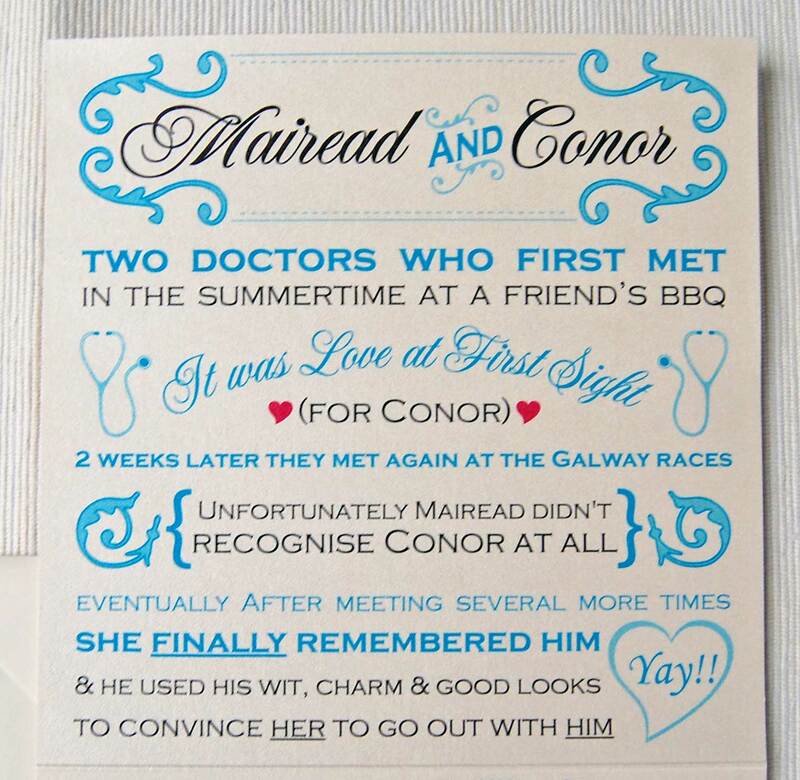 Mairead and Conor had a great story to share and I’m so glad they decided to do that with our Love Story wedding invitation. 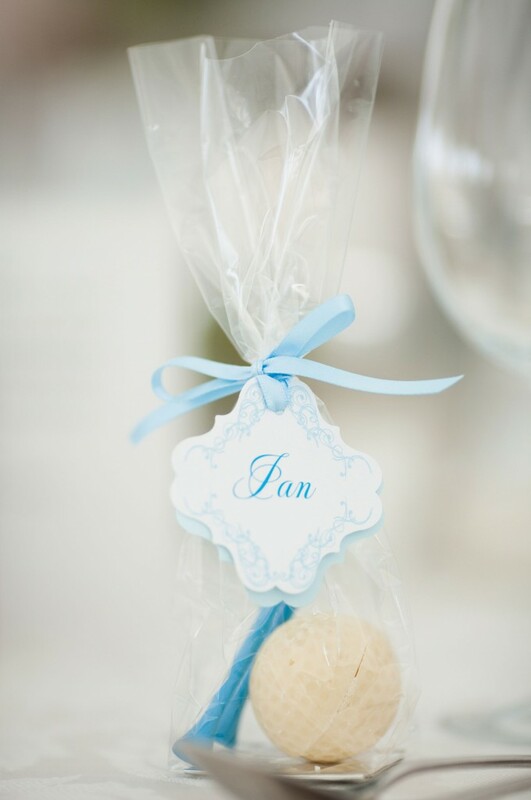 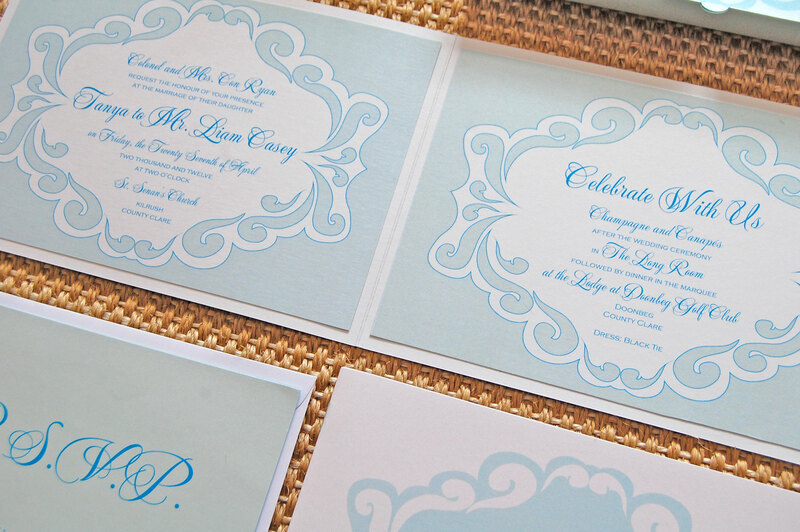 We started off with sky blue as the accent colour and cream pearl card. We also created Tag Evening invitations and Thank You cards to complete the suite. 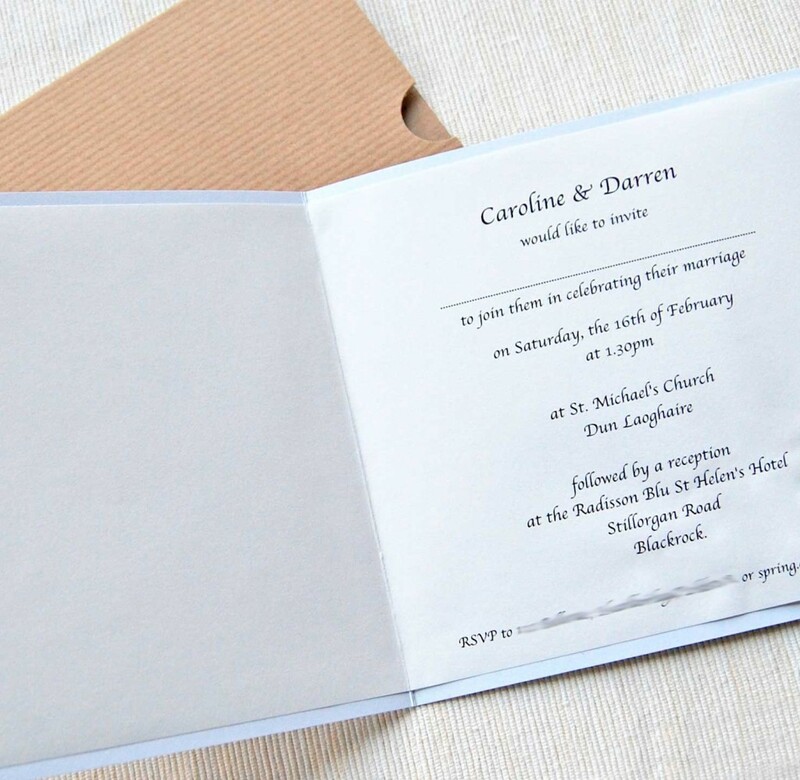 Being a stationery company makes us even more Eco-conscious so along with using recycled paper for all of our office printing and invoicing we are delighted to be able to offer two 100% Recycled Invitations as part of our range. 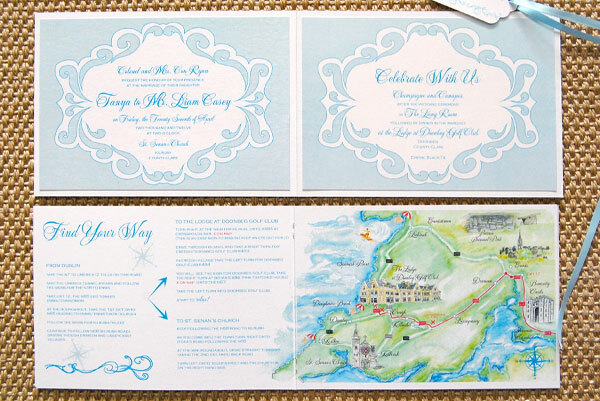 Our Kraft Wedding Invitation and our 100% Recycled Invitations. 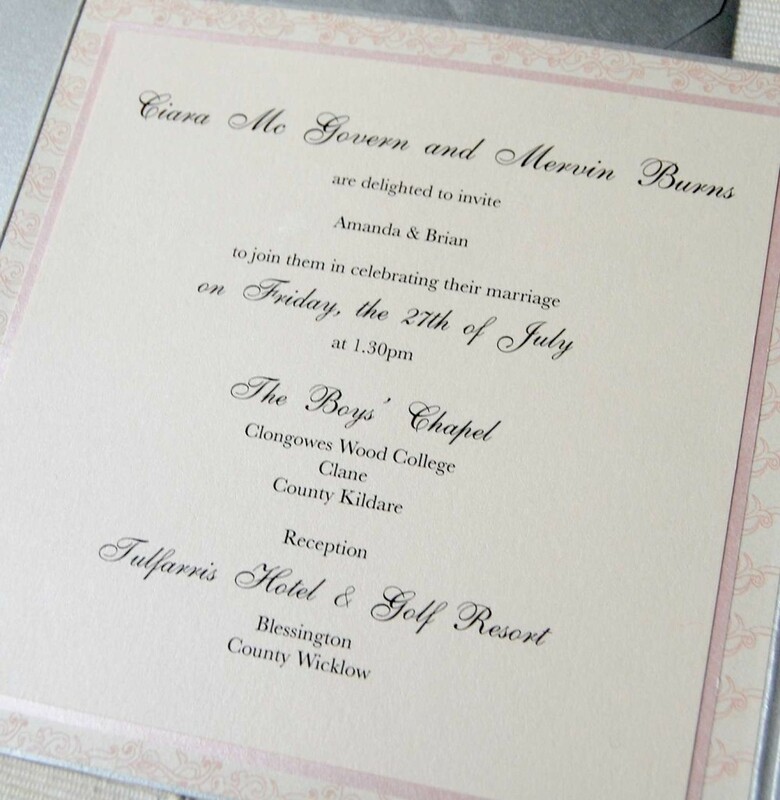 Caroline and Darren chose our 100& recycled wedding invitation and ceremony booklets for their wedding stationery. 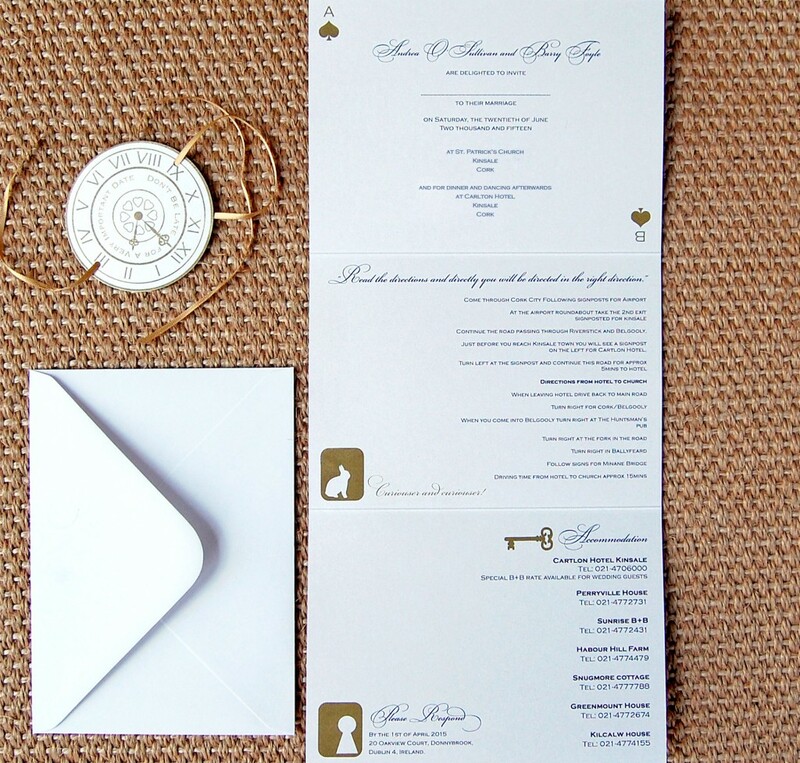 One of the best thing about designing our Love Story wedding invitations, as well as working with such lovely Brides and Grooms to be, is getting to tell their stories on their invitation. 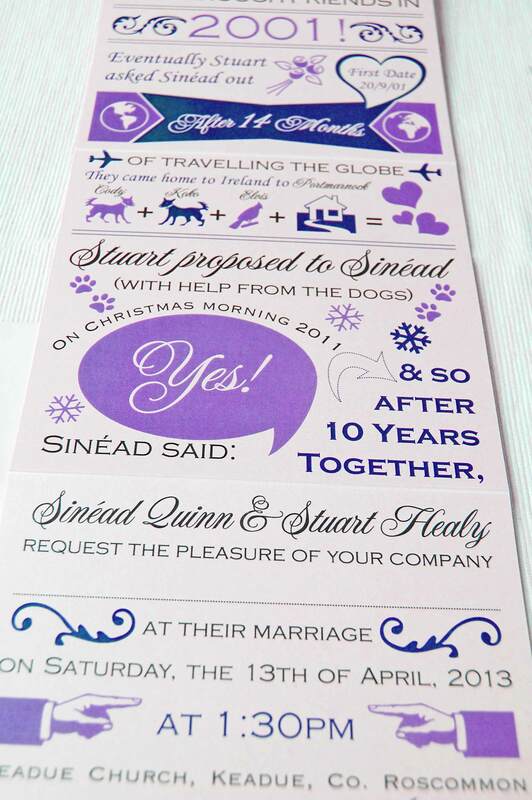 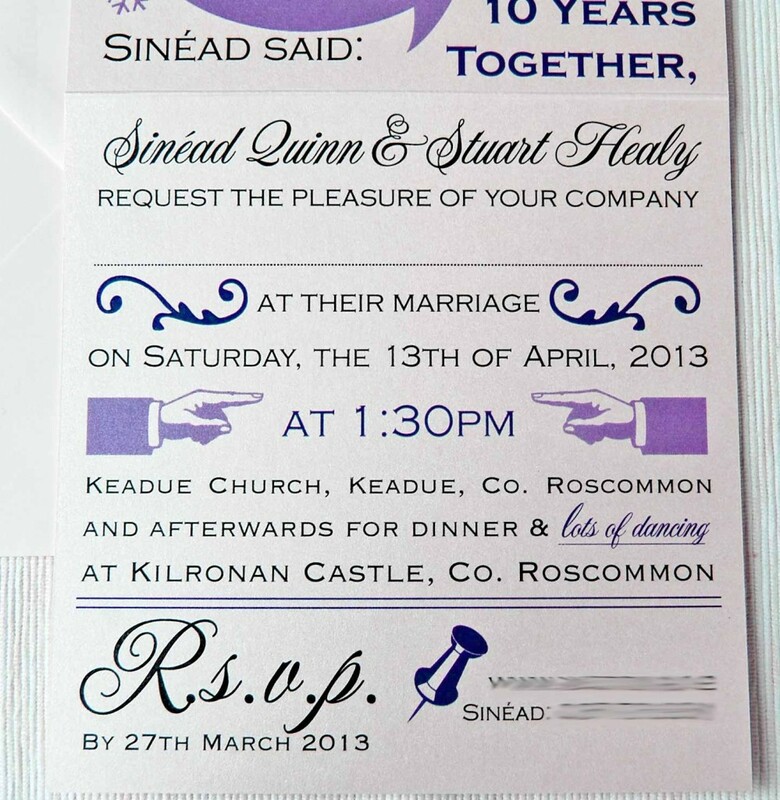 Sinéad and Stuart had such a great story and even included their pets in the invitation.